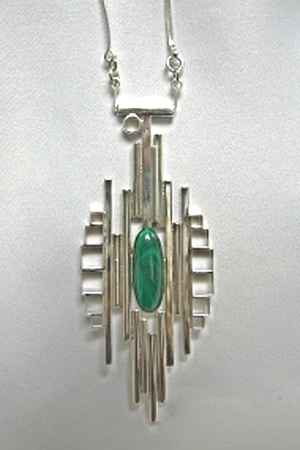 Cubist Jewelry - This is an eye-catching sterling silver geometric pendant that frames an oval green Malachite cabochon. This pendant is complemented by a 24" handmade sterling silver link adjustable chain. Limited Edition Necklace. This is a Sterling Silver pendant from our "Geometric Collection". This pendant is handmade using square and round silver tubing which frame a beautiful oval malachite cabochon. The pendant comes on a 24" handmade sterling silver adjustable chain. This necklace is signed and created by Aaron Rubinstein and Modern Art Jewelry.